Not to be confused with Rusted Root. I got this recipe from a blog I happened upon one day and immediately fell in love with. I think it’s vegetarian without specifically claiming vegetarian-ness (or maybe even vegan, regardless it’s all delicious). However, anyone that thinks vegetables are gross, boring or otherwise unpalatable should visit this blog. And for any wintertime naysayers (“That’s great but I don’t have fresh veg year ’round”), this blogger lives in Canada. HA! No more excuses. Eat more vegetables people! Do bear in mind that some of her recipes can be a little bit involved. So you know what I did? I cut this one in half. This was originally stacked veggies on top of lentils, so I just made the vegetable part because I was making… something else I forget. Probably something venisony. This recipe is so simple yet utterly delicious and makes a heck of a presentation if you are having people over. It also is a bright addition to typically heavy winter meals. My one regret is that I did not use red beets, because the golden beets at the store looked so wonderful. The red beets, though, would have been so much prettier in the stack. Next time. Preheat oven to 400 and prepare 2-3 baking sheets lined with tin foil and sprayed with pan spray. Whisk together olive oil, lemon zest, lemon juice (it helps to zest the lemon, then juice), rosemary and salt and pepper. Set aside. Slice the sweet potato and rutabaga about 3/4-1 inch thick, and the beets about 1/2 inch thick. 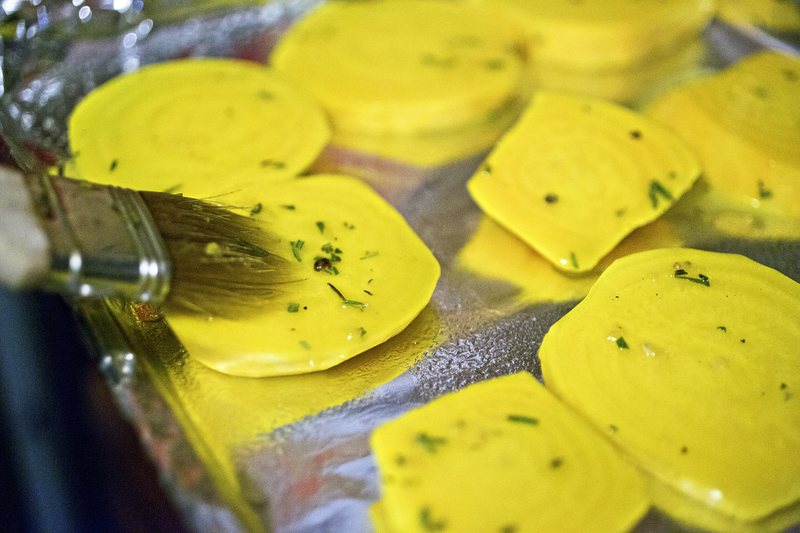 Place the potato and rutabaga on the same one or two baking sheets, and the beets on their own baking sheet. Brush the olive oil mixture over the slices. Once finished, remove from oven and let cool for a few minutes. Plate the veggies in a stack, drizzle with extra lemon oil (if you have some left) and garnish with chopped parsley.